Every historic site (well, perhaps 98% of them) have windows but they are rarely used in the interpretation. Here are several ways to use windows to set the stage, enhance the experience, or provoke thinking. Dayton Aviation Heritage National Historical Park in Dayton, Ohio. The easiest way is to use windows is as an introduction to the site by using a bold image or intriguing message that prepares the visitor for what’s inside. Perforated vinyl is ideal for this situation because it can display graphics while allowing light to flow inside and permitting views outside. 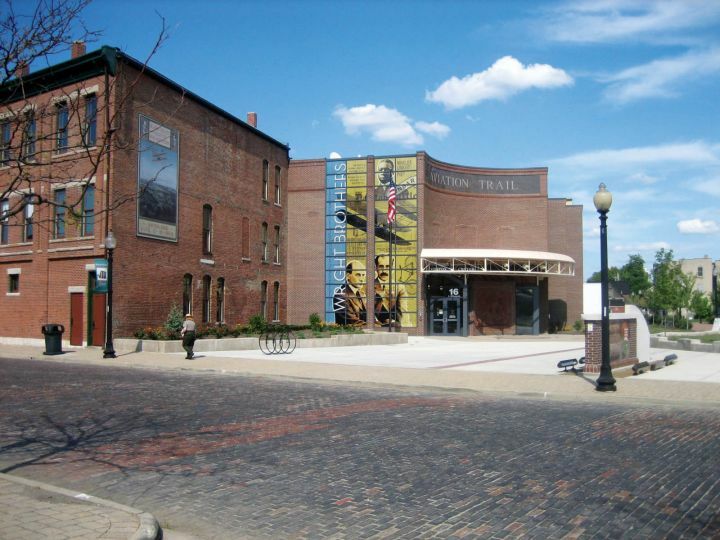 At the Dayton Aviation Heritage National Historical Park, perforated vinyl signs on the two-story windows of the visitor center feature enormous historic images on a yellow and blue background to help visitors find the entrance as well as set up the interpretation (otherwise this place looks pretty bland). Roger Brown Study Collection in Chicago, Illinois. The Roger Brown Study Collection (RBSC) in Chicago uses perforated vinyl signs in a different way. 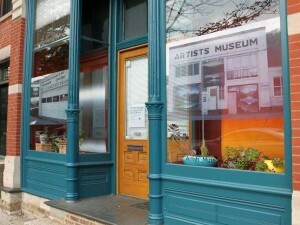 The front windows feature a single black-and-white photograph of Burnette G. Pletan’s Artists Museum in South Dakota taken by Roger Brown to “maintain a mysterious RBSC storefront identity to the street and celebrate the artists’ own ‘museums’.” RBSC is artist Roger Brown’s personal museum and rather mysterious (can you even tell what it is by its name?) so this window provides a subtle circular interpretation of the site that’s quite appropriate for the institution. Window clings make historic images part of the exhibit at the Ellwood House Museum in DeKalb, Illinois. I recently visited the Ellwood House Museum in DeKalb, Illinois where the carriage house was converted into an exhibit gallery. An interior window became a method of displaying historic images from Harriet Ellwood’s travels around the world as part of an exhibit curated by students at Northern Illinois University. Mitchell Marketing printed the digitized images on a low-tack translucent adhesive vinyl (specifically Oracle 3620), which were then individually applied by the students and trimmed to fit. Just a reminder, when using new materials, first test them in an inconspicuous place to be sure it’s reversible and not damaging to the historic building. 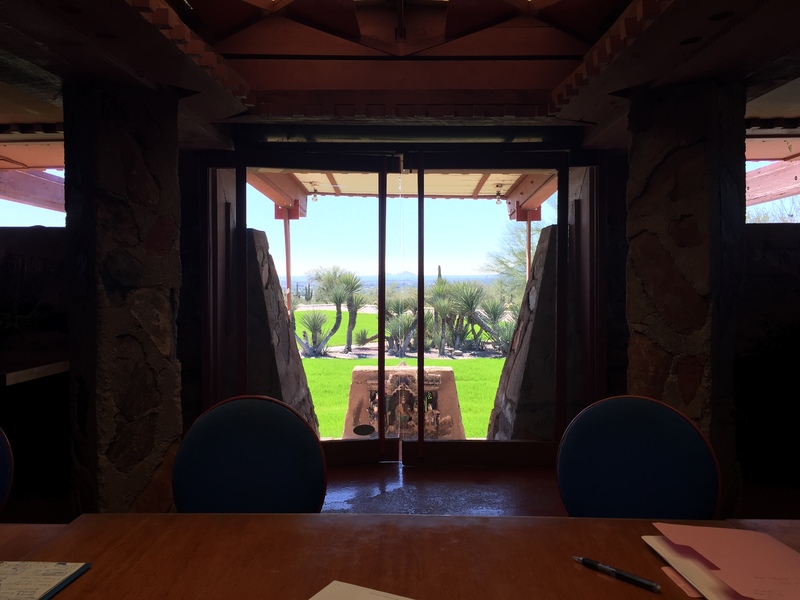 The view out of the glass doors from the former dining room at Taliesin West is aligned with the distant landscape. Historic sites mostly confine their interpretation inside and rarely use views to the outside to convey the content. Windows or doorways can make connections to the landscape and surrounding neighborhood, providing evidence and serving as illustration for the interpretive message. I’m currently working on the interpretive plan for Taliesin West in Scottsdale, Arizona and one of the big ideas is that Wright connected architecture to the landscape in many ways, including orientation. That idea clearly hits you when you look out a doorway and see a mountain perfectly framed in the distance. We’ll definitely be including windows in the tours to show how Wright connected architecture and nature. Exhibit label for a window at the Gaylord Building in Lockport, Illinois. From this window, you can see where the first line of railroad track was laid in 1859 down Commerce Street. Business was booming in Lockport, enough to encourage a handsome addition to the Gaylord Building. Lockport’s civic leaders were proud to have the railroad run down the town’s main thoroughfare. They awaited the prosperity the railroad would surely bring. Watch out what you wish for. The tracks began to crowd out other traffic from Commerce Street. And before long the railroad had taken away passenger traffic from the canal. The railroad was faster, more reliable, and ran even when the canal froze over in winter. The canal, however, continued to be competitive at transporting heavy freight, especially non-perishable cargoes like grain, coal, or lumber. I hope this suggests some ways that you can use windows in the interpretation of your historic site or museum. If you have additional suggestions or examples, please share them in the comments below. This entry was posted in Community engagement, Design, Historical interpretation, Technology and tagged Arizona, Dayton Aviation Heritage National Historical Park, Ellwood House Museum, Gaylord Building, Illinois, Northern Illinois University, Ohio, Roger Brown Study Collection, Taliesin West, Windows on May 7, 2015 by Max van Balgooy. One of the museums I work with – the Freiburg Natur und Mensch Museum – did a really simple but very effective window interpretation. 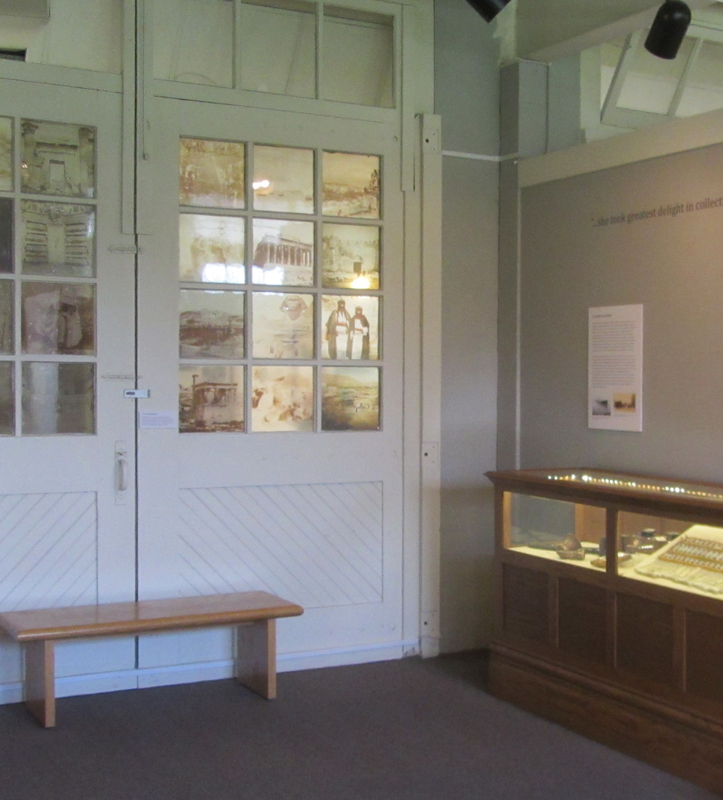 Their geology exhibit looks out onto a historic square that has multiple examples of different local and exotic stones used in walls, buildings, benches, etc. The museum put a frosted yellow film with rectangular cut outs over the exhibit’s windows, creating peepholes that direct the visitor’s eye to different geologic stories. There are short interpretations printed directly onto the film. The element is popular with visitors, and they put a lot of peep holes low on the windows so kids love it. Good reminder not to take anything for granted and to use all that is available to us for interpretive purposes. The historic house where I used to work, includes windows and the idea of framing views in a variety of ways. The home Sunnyside, designed and lived in by author Washington Irving, is sited on the banks of the Hudson River. Irving purposefully chose to put the dining room on the RIverside of the home in order to capture the view of the River. He frames the view with a large window and in so doing makes it into a painting. This device speaks to his lifelong connection to the River, his belief in the importance of nature and to his relationship to the Romantic movement in landscape design. 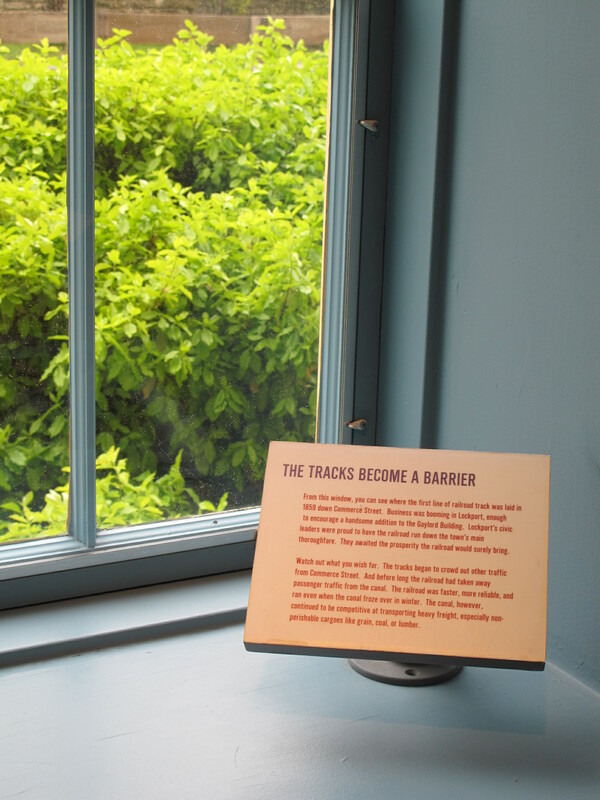 While on landscape tours, visitors are encouraged to create frames for themselves and find views that please as a way of understanding design choices that were made in the 1840’s.